offers something for everyone. From retirees and those dreaming about retirement, to boat owners, adventurers, travelers, and armchair sailors alike, Hofmann gives the reader “slice of life” moments through her compelling stories and captivating photos. Lois Joy Hofmann retired after a 35-year career in advertising, marketing, and management. Then she sailed around the world with her husband, Günter, for eight years, visiting 62 countries. Intrepid adventurers, the couple now embarks on more conventional travel with the goal of understanding countries and cultures that they omitted the first time around. When not traveling, Lois resides in San Diego, California, where she enjoys writing and photography. This is a couple who has always lived on the edge and has been challenged to explore new frontiers. Embarking on an adventure at sea, these former entrepreneurs are surprised to discover higher highs and lower lows than the rollercoaster corporate world from which they had escaped. The circumnavigation propels them out of the fast-paced fields of human genetics and biotechnology into the vastly different life of cruising. They had expected the circumnavigation to be a means of being independent and in control of their own destiny, but they encounter many riveting situations where they are clearly not in control. Lois Hofmann sailed around the world with her husband, Günter, for eight years, visiting 62 countries. She describes the couples’ first voyage from France, where they built their catamaran, to their home in San Diego—a gripping physical, intellectual and emotional journey—in Maiden Voyage, the first book of her trilogy, In Search of Adventure and Moments of Bliss. Lois Hofmann writes in a first-person style as if she is on location sending stories from the front in real time. Stories often begin with the date, location, and—for the nautical buffs—latitude and longitude. This all-encompassing book combines personal memoirs with stories about local cultures and customs, geography, catamaran sailing, and over 150 extraordinary photographs of their travels. All this is punctuated by magazine-style sidebars for each country visited that provide educational historical and geographic facts from around the world. 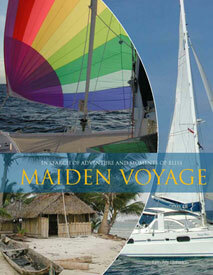 In Search of Adventure and Moments of Bliss: Maiden Voyage offers something for everyone. From retirees and those dreaming about retirement, to boat owners, adventurers, travelers, and armchair sailors alike, Hofmann gives the reader “slice of life” moments through her compelling stories and captivating photos. Every year, four times more adventurers climb Mt. Everest than complete a circumnavigation of the globe. Lois and Gunter Hofmann achieved their eight-year, 34,000 mile nautical triumph after turning 60 years old. They had set off in search of adventure and those rare Moments of Bliss, so difficult to find on land. They succeeded--and found so much more! Join them aboard their 43-foot Catana catamaran, Pacific Bliss, as they sail from France to San Diego on the first voyage of their exciting and amazing circumnavigation. Sample just a few of the extraordinary images captured from around the globe!